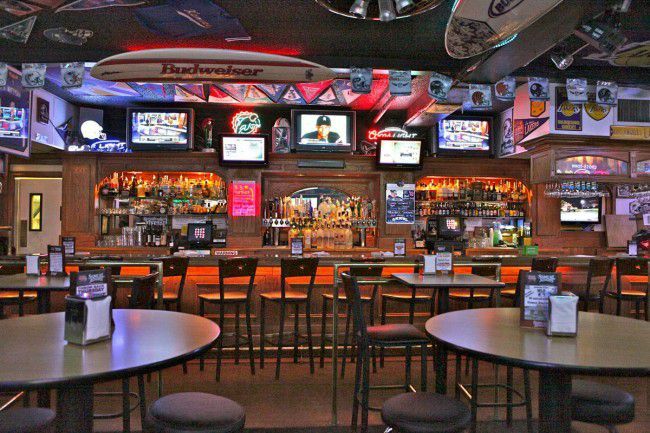 Whether you're looking for the best sports bar to watch the NCAA tourney, NBA finals, or go-kart races, chances are this list of the best sports bars in Houston will have something for you. BWW is basically the Wal-Mart of sports bars: it’s got pretty much everything you would hope for it to have. The Rice Village location gets super-packed super-quick, so get here early. Don't forget to order the mozzarella sticks, ​they're some of the best in the city. Located across from Minute Maid Park, this place has a built-in younger, louder, sportier vibe than a lot of other places. As such, you're either going hate it here or love it — there's no in between. It's the Tom Brady of sports bars. The best part about Underdogs Pub is that you can bring your pup along for the evening. There is a dog park in the back of the bar where dogs can enjoy themselves while we humans enjoy a drink and watch the big game. If you're looking for great beer on tap and lots of screens, Revelry is a safe bet. It's also one of the best happy hour spots near the Houston Med Center in no small part because the food is delicious. Try the Revelry Burger — which comes on a soft pretzel bun and topped with bacon, crispy onions, and blue cheese. Their Facebook page lists upcoming specials. If you're looking for a no-frills, quasi-dive bar to grab a steak, drink a beer and watch a game, PJ's does the trick quite nicely. Swing by on Thursdays for specials on steaks, or for happy hour deals Monday through Saturday 4 p.m. - 7 p.m.
For an Irish Pub, Pimlico has a surprisingly impressive cocktail selection. And when you're not watching a game, you can hang out in their large outdoor patio. Word of caution though: Pimlico doesn't always have food or a great selection, so plan accordingly. Nick's Place has wall-to-wall TVs so that you never miss a moment. The food is largely your run-of-the-mill Italian cuisine — including pizzas, calzones and even gelato — but the menu is extensive and has plenty of options for everyone. The Boot specializes in a cajun/creole atmosphere and cuisine, and walking in, it has a distinct crawfish-boil-type feel. If you're the kind to prefer to sit outside, this is the place for you. With a wide selection of brews from all over the country, Beer Market Co. truly lives up to its name. Combine that with an excellent menu and a large selection of TVs, and it's a great place to catch any game.